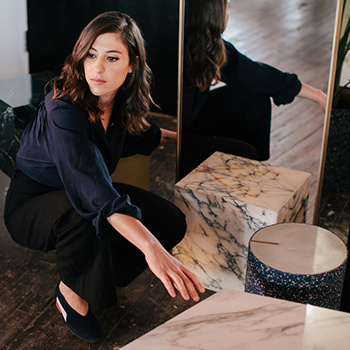 Arielle Assouline-Lichten may not yet be a household name, but her impact within the industry merits a nod—or perhaps 20,000. 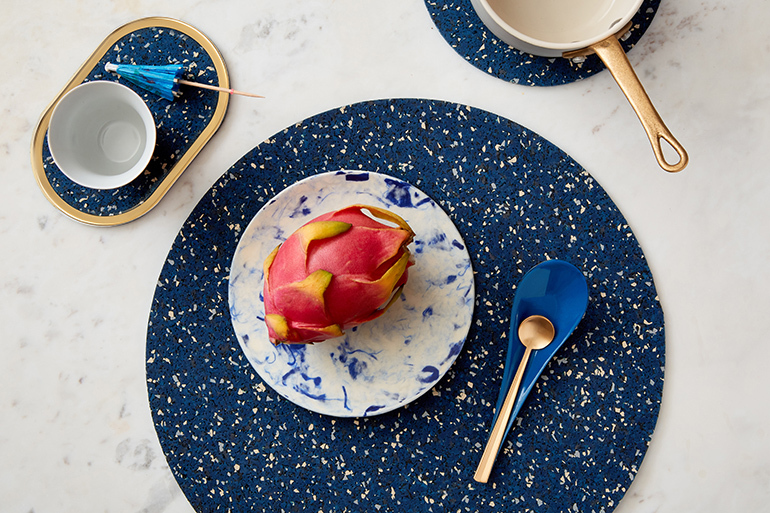 Design connoisseurs recognize her brand, Slash Objects, as a purveyor of stylish home furnishings and accessories that blend rich materials in unexpected ways. But some may also know her as an activist force whose steely resolve and diligence helped elucidate the rampant gender parity issues afflicting the architecture and design professions. While studying at Harvard’s Graduate School of Design in 2013, Assouline-Lichten launched a petition for the Pritzker Prize Committee to retroactively recognize Denise Scott Brown as a laureate. As a refresher: Scott Brown was infamously excluded from the honor despite her longtime husband and business partner Robert Venturi receiving the award in 1991. Assouline-Lichten’s petition received over 20,000 signatures, even catching the eye of some of the world’s most renowned practitioners. Fast forward to 2018. The globetrotting designer, who cut her teeth working for such blue-chip firms as Kengo Kuma and Associates, Snøhetta, and Bjarke Ingels Group, has carved a niche within Brooklyn’s burgeoning design sphere. 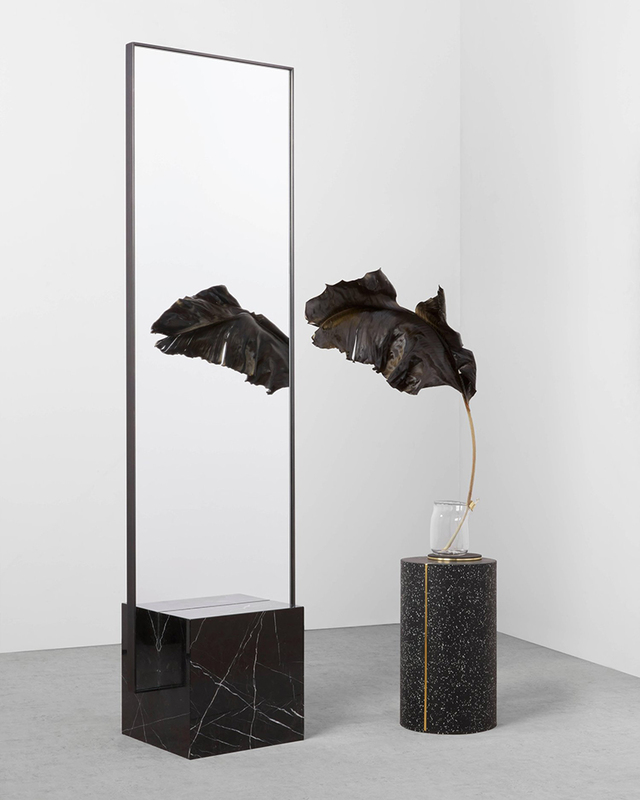 Assouline-Lichten founded her multidisciplinary design firm, Slash Projects, in 2013, with Slash Objects following three years later. She fabricates much of the latter’s collection using a post-consumer recycled rubber material built for high-endurance flooring, which lends each piece extreme durability. But don’t get too distracted by its functional qualities. Terrazzo-like in appearance, the material blends seamlessly with such luxurious surfaces as brass and marble, lending the entire collection a sense of understated elegance while staying on-trend with contemporary design sensibilities. 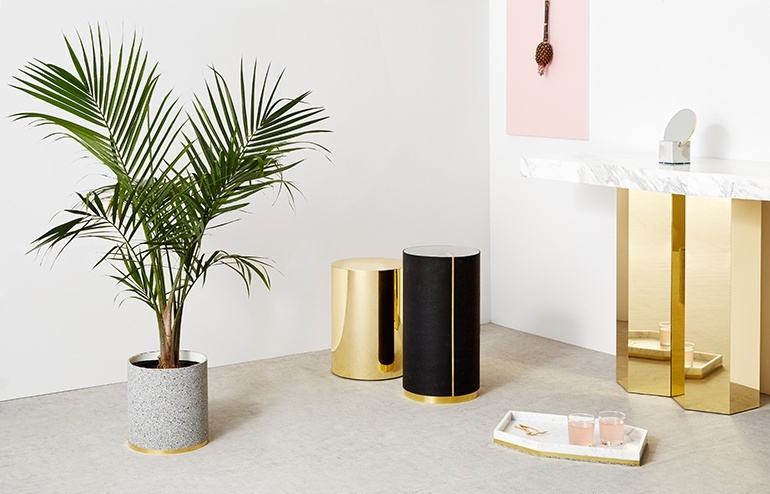 The brand’s Coexist Collection even received Best in Show recognition at the 2018 NYCxDESIGN Awards presented by Interior Design and ICFF. Assouline-Lichten sat down with Interior Design to share her thoughts on gender parity in the industry, how she discovered her signature rubber material, and why she loves living and working in Brooklyn. Round Placemat and Brass Oval Coasters in Royal. Photography courtesy of Slash Objects. Interior Design: How did growing up in Philadelphia and studying at Harvard GSD shape your design sensibilities? Arielle Assouline-Lichten: My parents moved to Philadelphia in the 1970’s on a whim. My mom was born in Denmark and my dad is French Moroccan; they met in Switzerland and planned to road trip across the U.S., but never made it out west. More than anything, an early exposure to travel shaped me. Philadelphia was a home base, but we explored other countries and cultures as often as possible. I moved to Berlin in 2007, and from there I went to Copenhagen and fell in love with design, had a long and magical stay in Venice, and lived, worked, and studied in both Paris and Tokyo. When I arrived at Harvard, I had already built a lexicon of design tools I didn’t know I had. The GSD taught me to harness my abilities and be rigorous in my design methodology. I also explored the physical process of making and set out to use as many tools and machines as possible. Our resources were precious so I wanted to use them while I could. This became instrumental for creating Slash Objects because I already had an understanding of the fabrication process and how to machine various materials for different needs. 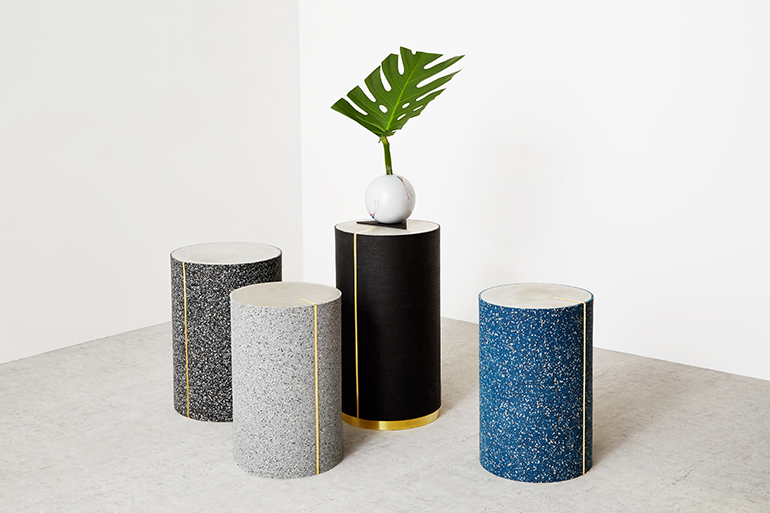 Rubber CYL Side Tables. Photography courtesy of Slash Objects. ID: While reinvigorating the student group Women in Design at Harvard GSD, you launched the petition for Denise Scott Brown to be officially recognized by the Pritzker Prize Committee. This amassed thousands of signatures, including Pritzker laureates. Tell me about this experience. AAL: I’ve always been a staunch advocate for social justice—it runs in my veins to stand up for what I believe in—so when I came across an article about Denise Scott Brown during my thesis year, I was shocked that she still hadn’t been recognized as an equal partner to Robert Venturi in the prize he was awarded in 1991. This is a blatant act of sexist discrimination by the Pritzker Prize which I thought reflected the profession’s values in the 90’s, not today. I was wrong and the outcome was entirely different than expected. I was so infuriated that nothing was being done to support Denise that I immediately drafted a petition that same morning. Together with a classmate Caroline James, who had just re-started the student group Women in Design, we launched a very thorough campaign to gather signatures and petition the Pritzker Prize into recognizing their outdated mode of thinking. We received over 20,000 signatures, including strong support from Zaha Hadid, Rem Koolhaas, and nine past Pritzker recipients. The effects have been wide, emboldening the school as a leading activist institution in architecture, and galvanizing the profession into demanding more change. Though we still have not opened the Pritzker Prize Committee to recognize and eliminate the sexism that tarnishes their legacy, other prizes around the world have updated their policies and recipients to be more just, and we helped expose the profession’s rampant sexism. 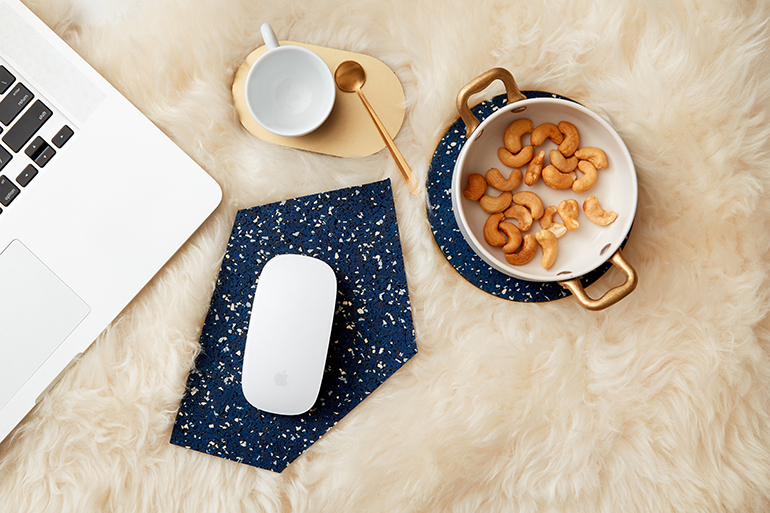 Gem Rubber Mousepad and Brass Coaster in Royal. Photography courtesy of Slash Objects. ID: What are your thoughts on the state of gender equity in architecture and design today? AAL: The design field has much work to do to achieve gender parity, but we’re making progress. We now have many female leaders in institutions, which will have a long-term effect on how architects are seen—and how they see themselves. I believe in role models as a way to envision potential futures, so seeing women in positions of power lets younger generations envision themselves attaining that as well. Now more than ever, we’re seeing people call out discrimination, which is crucial to eliminate behavior that maintains an unbalanced status quo. From exposing Richard Meier to the power of #metoo, we’re moving forward, despite still being far from equality. ID: You’ve previously worked for Bjarke Ingels, Snøhetta, Kengo Kuma, and studied with Toyo Ito. What were the most important takeaways from each experience? AAL: I strongly admire both Scandinavian and Japanese design and have truly been shaped working at all these amazing firms. Working at BIG in Copenhagen was my first bona fide “office” experience which strongly influenced how I view architecture and the design process. At the GSD, I was lucky enough to be chosen to study with Toyo Ito in Japan, which changed my life. I love so much about Japanese design thinking and how they use materials in everyday life—there’s a playfulness to it, which influences my own work. There’s also a huge cultural difference in how Japanese and Scandinavian designers treat the boundaries of interior and exterior, which is what defines the way they create spaces. Each opportunity undoubtedly instilled within me the framework from which to create my own work. The Home Collection. Photography courtesy of Slash Objects. ID: Slash Projects explores design from all angles, which reflects your multidisciplinary training in graphics, product design, architecture, and digital. How does your approach differ from one discipline to another? AAL: There’s a consistent mode of thinking that ties different design disciplines together—our tools are the differentiating factors. Design is about connecting humans with their environment, whether digital or physical. We think about how our design tools impact the work itself, and aim for a thoughtful design process that infuses a wide range of mediums with delightful experiences for humans. ID: You founded Slash Projects in 2013, with Slash Objects following three years later. Tell me about this journey. AAL: The first few years of Slash Projects were all about saying yes to different projects—this was a time for learning, growth, and getting a solid base of projects underway. I always wanted to tackle product design but didn’t have a clear sense of how. While working as an architect on a new construction project in SoHo, I discovered the recycled rubber that became the starting point for Slash Objects. I saw (and continue to see) so much potential for this material and decided to take on a project from concept to execution. Instead of working with a client, we took this in-house and designed every aspect: branding, packaging, products, and art direction. It’s so satisfying to see a project through so many layers of its lifespan. Nero COEXIST Standing Mirror and Black Concrete Rubber CYL Table. Photography courtesy of Slash Objects. 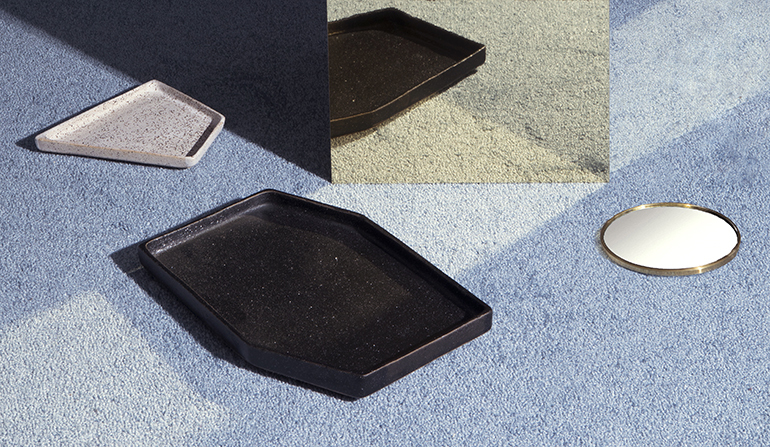 ID: Central to Slash Objects is a post-consumer recycled rubber that you seamlessly pair with other luxe materials. How did you discover this material and what are some of its characteristics? AAL: That project was inspired by “old SoHo,” so we were using marble, brass, steel, and other beautiful and rich materials that have history and weight. Also sitting on my desk were gym flooring samples because we needed to outfit a gym. I soon learned that specific material was made of recycled rubber and LEED-certified. It also has a beautiful texture reminiscent of terrazzo, which was making a comeback. I started experimenting with the samples by using them in different ways. Since the rubber is made for high-endurance flooring, it’s almost indestructible. I brought some home with me and used it as coasters, placemats, and candle holders. Anything that came to mind, I prototyped. Ultimately, I refined the prototypes for a launch at Sight Unseen OFFSITE in 2016. That led to really positive reception and the continued expansion and development of the line, released to wholesale in 2017. We continue to work with local manufacturers and assemble all the pieces in our Brooklyn studio. ID: What has Slash Objects taught you about materiality and how different materials can come together? AAL: I am very interested in materials as a starting point for design—because our world is not infinitely expandable, design is a way to transform the materials we can use responsibly. What can we create that has a positive impact while still being beautiful, versatile, and functional? These are all elements we expect from design, but with an added thoughtfulness to how pieces are produced and where they might end up. 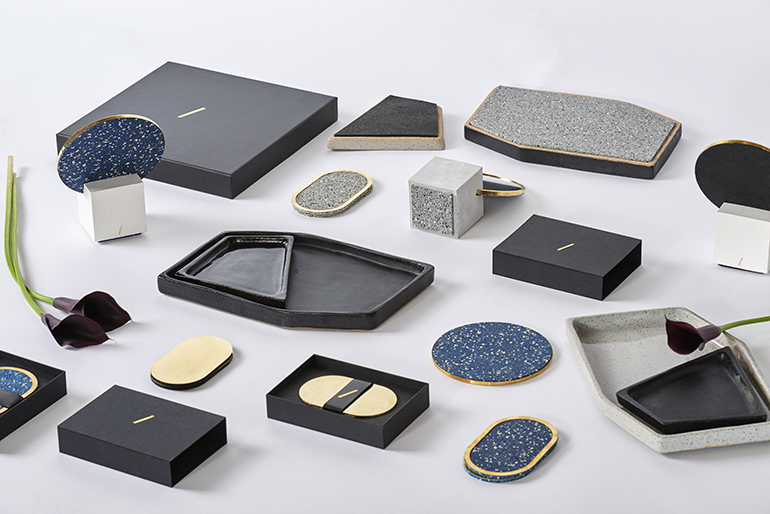 Slash Objects creates a way of working with materials that highlights the physical act of making products and how our materials are drawn from the earth, which has limited resources. I want the brand to embody the notion of thoughtful design for a better world. Ceramic Nesting Trays. Photography courtesy of Slash Objects. ID: What’s your favorite part of living and working in Brooklyn? AAL: There are so many fabricators in Brooklyn left from different eras of American manufacturing. I can have marble fabricated a short distance from where my metal is fabricated, which is close to my rubber die cutters. Being in Brooklyn is what allows Slash Objects to exist—the proximity of everything made it possible to fulfil my vision to create this brand in the US by starting small and growing locally. ID: What’s the best part of your job? AAL: Working for myself, creating daily, and saying yes to unexpected opportunities that lead me to places I never thought I’d go.